EUR/USD was range bound throughout the session with a lack of news to influence a push in either direction. Several upswings mid-session failed to extend outside of the range between 1.0838 and 1.0869 though the market was testing the downside more aggressively. At the lower end of the range, support is occurring around the 61.8% fib retracement level. The 50-hour moving average is acting as a resistance and the pair has been trading beneath this level since the middle of the month when sentiment turned bearish. Economic news was thin, but overall relatively uninfluential. German producer prices fell to a five month low in June. The prices that German manufacturers charge for finished goods has remained stubbornly low despite efforts by the ECB to stimulate inflation. Year on year the producer prices index dropped by 1.4% – worse than the -1.3% forecast. Price growth was unexpectedly subdued last month due to falls energy prices. Greece repaid its arrears to the IMF Monday using money received from an EU bridging loan. Banks also reopened but the stock exchange remained closed. The immediate crisis may be over but the pain is likely to continue both for Greece and the Eurozone well into the future. 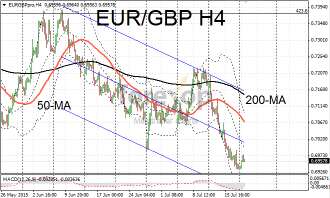 The euro gained slightly on both sterling and the yen. 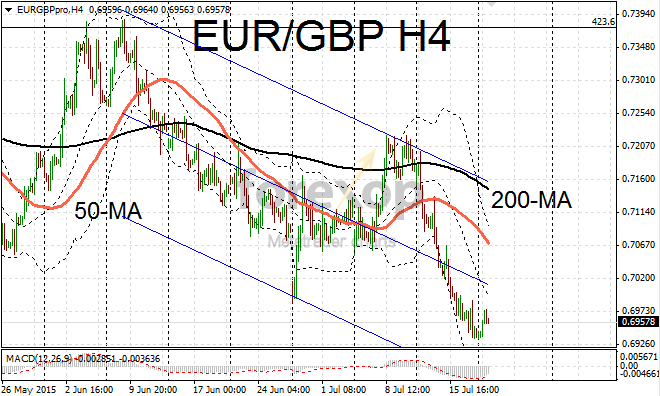 EUR/GBP made a weak rebound but failed to break back above the 0.70 barrier which has now become a resistance. The euro is trading at eight year lows against the British pound. On the four hour chart the MACD is at an oversold level indicating there may be some scope for an upside move – but given the fundamental outlook this would probably be limited. EUR/JPY is meeting resistance around 135.2. Sentiment remains bearish and the pair remains stuck beneath the 200-day moving average.